I’ve enjoyed something of a cycling renaissance in 2018 – and it’s all thanks to being one of the lucky few selected to join Team Alpecin. I’ve thought of myself as a cyclist since late childhood, but my actions haven’t always matched up to that mental model. My commitment to riding has waxed and waned with the competing demands of work, family, travel, other interests and day-to-day life. But the Alpecin experience has reignited my passion for riding and so much more. From being told I had made the cut by Cycling Plus Editor Rob Spedding back in February, to meeting all my fabulous teammates in Bielefeld in Germany in March, going to the Tyrol for a training camp and then seeing everyone again at L’Etape du Tour I can look back on a year of incredible memories. And even better, there’s amazing photographic evidence for most of it. Truly, when I am a pensioner and looking back on my life, 2018’s cycling adventures will be on the highlight reel. The big lesson that I’m taking away from the year is that we’re all capable of more than we imagine – by having a meaningful goal (putting in a good ride at L’Etape du Tour), a plan to get there and some accountability (thanks to coach Florian) incredible things will happen. Last year I thought it was nigh on impossible to ride for two hours on the turbo before work. This year I know differently. Last year I wouldn’t have believed it was possible to join a club ride on a Tuesday evening after work, to get out of London and into countryside and add another 75km to my week. This year I know differently. Last year I would have doubted my ability to ride 225km and still have a sprint at the end. This year I know differently. Last year I would have questioned the wisdom of riding slowly to get faster. This year I know differently. There are so many subtle and not-so-subtle things I have learned this year, and for that I am very grateful. The big lesson came from the experience of setting an ambitious goal and making good on it by having a coach and a plan to guide me and keep me accountable. The importance of that accountability can’t be overstated and I’m now looking at many areas of my work and home life and wondering how to recreate that system. My subtler lessons come from riding with people like Mario Kummer, Maurizio Fondriest and our very own team captain Jörg Ludewig at the Caldaro training camp. Trying to follow Lude’s line downhill, or having Mario offering insightful guidance on something as simple as when best to change gear have left an inedible mark on my cycling. As the season winds down I am able to reflect on so many highs – the Tour of Yorkshire with the full UK squad, or the Dragon Ride in Wales with teammate Les Pegler and a blistering (well, by UK standards) sun in the sky for 225km. There were the trips to Germany, to Italy, to France and to Austria – although, sadly, Austria has left me with unfinished business and maybe something to prove. When I got to Solden, in Austria, for the Otztaler Radmarathon, I was fighting off the cold and couldn’t start the event. I was gutted not to ride after working so hard to maintain my fitness from the L’Etape. The team has an incredibly active WhatsApp channel, and I hope very much that it stays active in the months and even years to come – truly it has been special to be part of a team, to have felt a real team spirit and to have made many new friends. Looking ahead to 2019 I am looking for new – and possibly even more ambitious – cycling goals to build on the momentum of Team Alpecin 2018. Maybe 2019 will involve a return to Austria to settle the score in Solden. Or perhaps the Land’s End to John O’Groats ride? Maybe even some racing? Whatever it involves, I will be doing a lot more of the go-slow-to-go-fast training that coach Florian prescribed – who knew it could work so well? Most of all, I will be riding my bike at every opportunity and wearing my Team Alpecin colours with pride and gratitude for rekindling an old love. 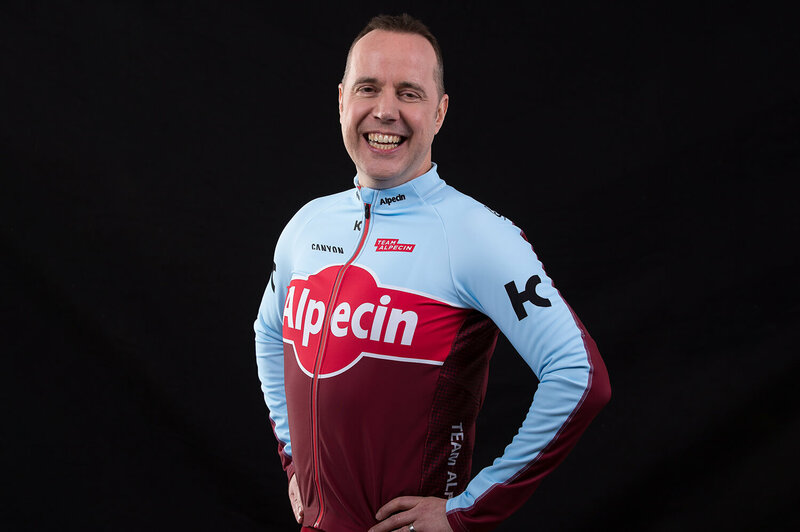 Murray Cox from London (UK) was one of the 14 lucky ones who made into Team Alpecin 2018. He was one of the first UK team members ever since Team Alpecin went international.